We are less than one week away from WWE's grandest event WrestleMania. The stage is all set for the mega event as WWE Superstars get ready to fight with individual wrestlers. 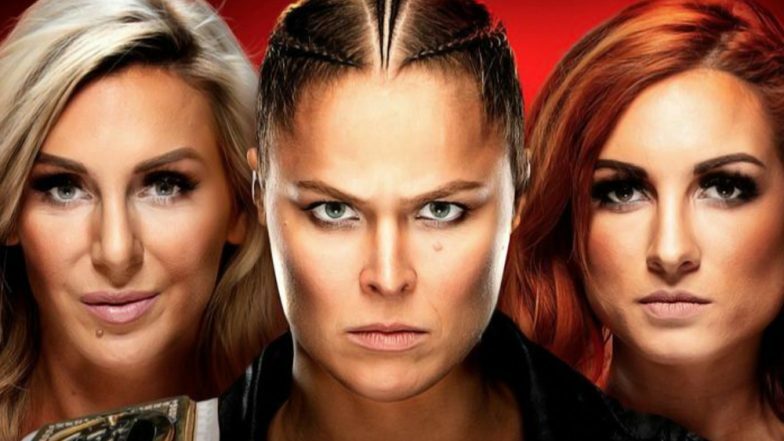 Let us find out the result from April 1, 2019 episode of Raw, as WWE Women Champion Ronda Rousey, Becky Lynch and Charlotte Flair get arrested just before WrestleMania 35. WrestleMania 35: WWE Declares the List of Participants for Andre the Giant Memorial Battle Royal at Their Flagship Event! This past episode of RAW featured some incredible moments apart from the arrest of Rousey, Lynch and Charlotte. The Animal Batista appeared on the show and gave final remarks on Raw before fighting Triple H for one last time at WrestleMania 35 in a no hold barred match. The Road to WrestleMania 35 Begins: Watch Video of Previous Year WWE’s Mega Event in 60 Secs. The chief brand ambassador of WWE first made crowd 'April Fool' by saying that she will be the fourth wrestler to compete in the main event at WrestleMania 35 for WWE Women's Champion. Stephanie then expressed her happiness by stating that for the first time in 35 years WrestleMania will have Women's title match as their main event. As Charlotte is the new WWE SmackDown champion, therefore Stephanie added that the winner of the main event at WrestleMania will walk out with both the titles. Click here to see what all Stephanie McMahon said. Paul Heyman alongside his client Lesnar addressed the crowd that current WWE Universal Champion broke the streak of Undertaker. Brock Lesnar also destroyed hopes of Roman Reigns to become world champion in WrestleMania last year. Click here to see what all happened between Seth Freaking Rollins and The Beast Brock Lesnar. The trio teamed up to face The Riot Squad in the main event of this past episode of Raw. After Ronda Rousey put Liv Morgan in an arm-bar submission to give her team a victory, she immediately went on to assault Charlotte Flair. Becky too got involved in this, which forced not only the officials but cops to come out and bring things under control. The three of them got arrested on the ground of assaulting cops. Click here to see the backstage brawl between Ronda Rousey, Becky Lynch and Charlotte Flair which even led to the damage of cops vehicle. Apart from the above actions, we saw Braun Strowman defeat Michael Che and Colin Jost. Baron Corbin faced Rey Mysterio and pinned him to defeat, Mysterio is the No.1 contender for WWE United States Champion. Bobby Roode and Chad Gable lost to Heavy Machinery in a Tag Team match.